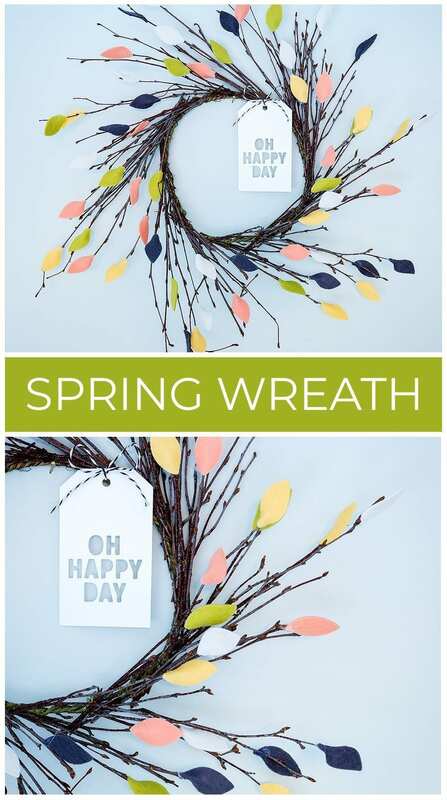 I have something a little different to share today – a spring wreath. 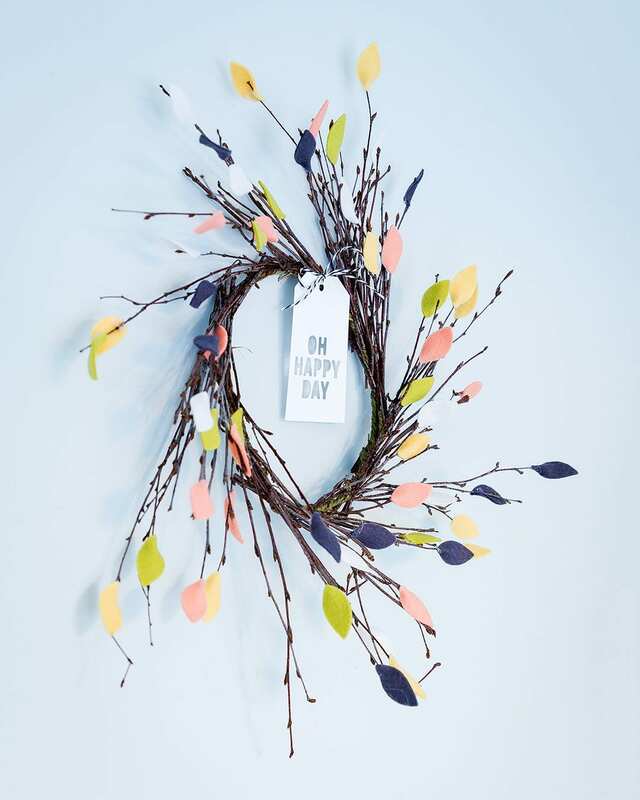 I was browsing around Pinterest the other day, as you do, and fancied making something with felt leaves and when I entered that term into the search box, the grid was filled with wreaths. I decided on a twiggy wreath with felt leaves in a spring colour scheme and hoped that what I had in mind I’d manage to achieve. I think this is my first piece of home décor I’ve made. I wanted to mention that the photos I took and this video don’t do this wreath justice. You can get an idea of how to make a wreath such as this from the video, but you don’t really get to see it at it’s best on my black craft mat. Also, the photos I took again aren’t doing it justice. It shows that it takes practice to take a good picture and I’ve got used to taking my card photos, and this wreath on the wall was something new and out of my comfort zone. I hope you enjoy all the same. I’ve linked all supplies at the end of this post. Compensated affiliate links used where possible at no cost to you. I started looking through my dies for leaf shapes I could use. When I started looking, I found a surprising number of dies that would work. The Winter Flowers stamp and die set has a lovely oval shaped leaf die as does the Hope Blooms set. The One With Nature set has a variety of leaf shapes including the nice simple oval leaf shape I had in mind. The Forget Me Not Flowers dies, and Hydrangea Petals dies I pulled out in case I wanted to add some flowers. Finally, the Outline Clustered Leaves die which would cut some oval-shaped leaves in one pass. I chose the One With Nature leaf die as it was slightly larger than the others and its simple shape would be easy to die cut from felt with minimal wastage. I pulled out five colours of felt from my stash. I’m afraid I haven’t kept a note of where the various felt colours were from, here are some felt and felting supplies to check out if you don’t have any in your stash. When choosing your felt I’d look for a thick one with high wool content as I find those hold up better and keep their shape well once die cut. I worked my way through the five colours of felt cutting 11 from each colour. I’m not sure why 11, I think perhaps it was 10 and then 1 for good luck! I was half expecting to have to cut more once I started adding these to the wreath, but actually, 55 leaves turned out to be just right. It took me about 15-20 minutes to cut the leaves out. However, I counted this as my colouring stage to this project if that makes sense. 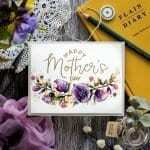 Generally, when I am making a card there are at least 15 minutes of Copic colouring, watercolouring or multilayered stamping and die cutting the felt leaves seemed like the equivalent for this project. 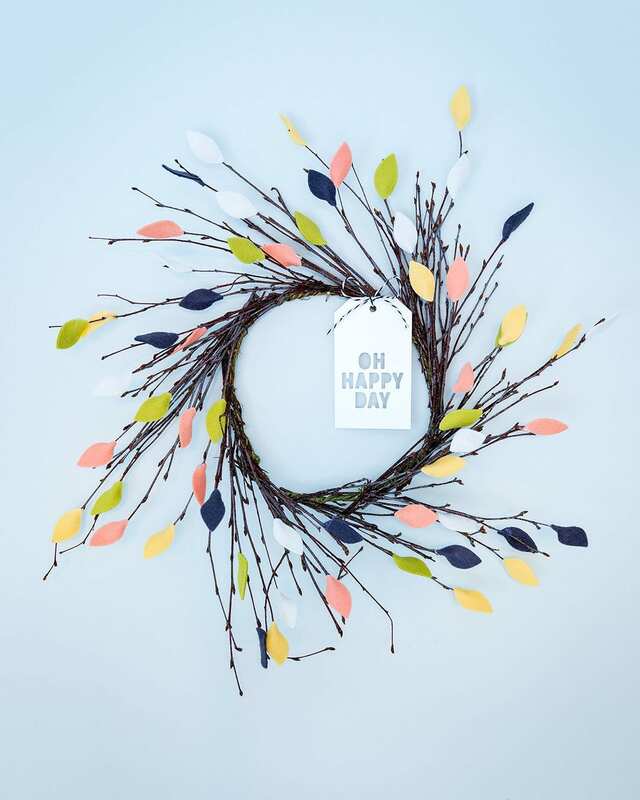 Once I had my pile of die cut leaves, I turned to the wreath. I could have easily made this myself by finding some twigs from the garden and tying them together, but I must admit I popped into the local florist who quickly whipped this up for me and likely made a much better job than I would’ve done. There’s a ring of wire wrapped with natural looking material, and then little bunches of twigs are tied in at various points around the circle. The ring is I guess the size of a side plate and then with the twiggy pieces sticking out the whole wreath is similar in size to a dinner plate. To attach the leaves to the wreath, I heated a glue gun and then added a small pea-sized amount of hot glue to the widest end of each leaf and pinched it around a twig. I didn’t add the leaves right to the tip of the twigs but just below the tip so that the twig supported the felt leaf. I felt if I’d added the leaves right to the tips they wouldn’t have been very stable and would’ve wafted around a little. I also added a few of the leaves further down the twigs closer to the ring of the wreath so that there was a spray of colour coming out from the centre. I started with one colour of felt leaves and added all of those around the wreath, spacing them roughly evenly around the circle before moving onto the next colour. This way I hoped to get good even coverage of leaves and colours around the wreath. It goes without saying that you have to be careful with a hot glue gun, as the name suggests the glue is hot, but I found that I didn’t have a problem as long as I added the hot glue in place and then left it for just a moment before gently squeezing the leaf into place. I did find however, I got lots of those spider’s web-like stringy bits everywhere, and so it was a good job I was doing this on my glass craft mat which is easy to clean up afterwards. A lot of the wreaths I’d seen on Pinterest had no other embellishments apart from possibly a bow. However, I did see some with tags, and I do love a good tag. 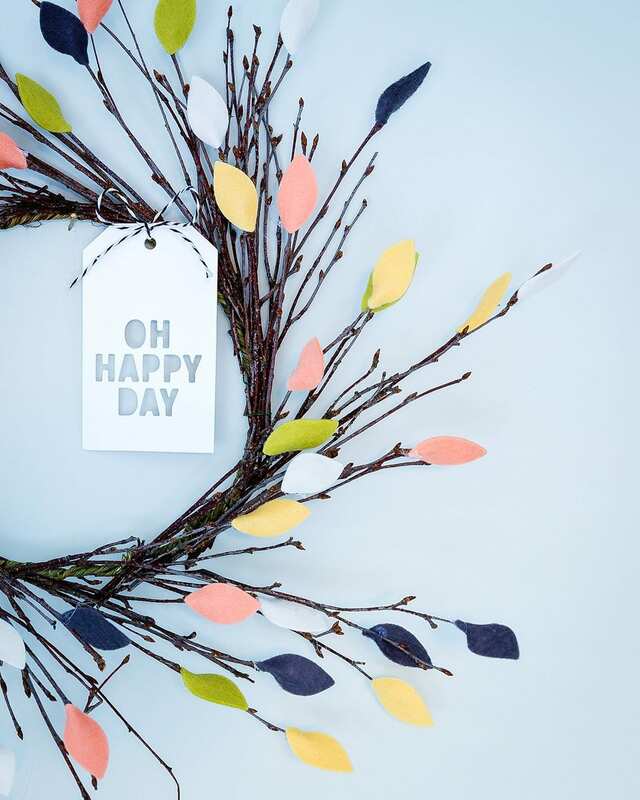 As I was aiming for a modern, minimal look to this wreath, I decided on an equally modern tag and pulled out the Oh Happy Day Tag from CZ Design, and Simon Says Stamp. I love the clean lines and simple font of this tag and cut it from Bazzill Marshmallow card to get a warm white colour similar to the white felt I’d used. I tied a black and white twine bow to the top of the tag and then attached it to the wreath with more hot glue. As I mentioned at the beginning, the photos and video for this wreath really don’t do it justice. I have it on my study wall just beside my computer, and it is bringing me great joy every time I glance over — a reminder of the spring to come even if outside is still freezing for now. Oh Debby, how lovely. It’s so crisp and fresh. Love how the navy leaves give depth and balance the darkness of the twigs. I hope you’re proud of it. I think it has a very contemporary feel which I love. Thank you so much for sharing your experience. Absolutely ingenious and beautiful! Definitely makes it want spring to arrive sooner than later! Beautiful, Debbie! Love the color choices for the leaves! Looks like spring is near! Fabulously springy. I love twiggy wreaths.